The rules for this game are really simple. Before each turn you can specify the level of bet you want to set (from 1 to 5). A higher bet can earn you more money, but you will also lose more if you do not score. 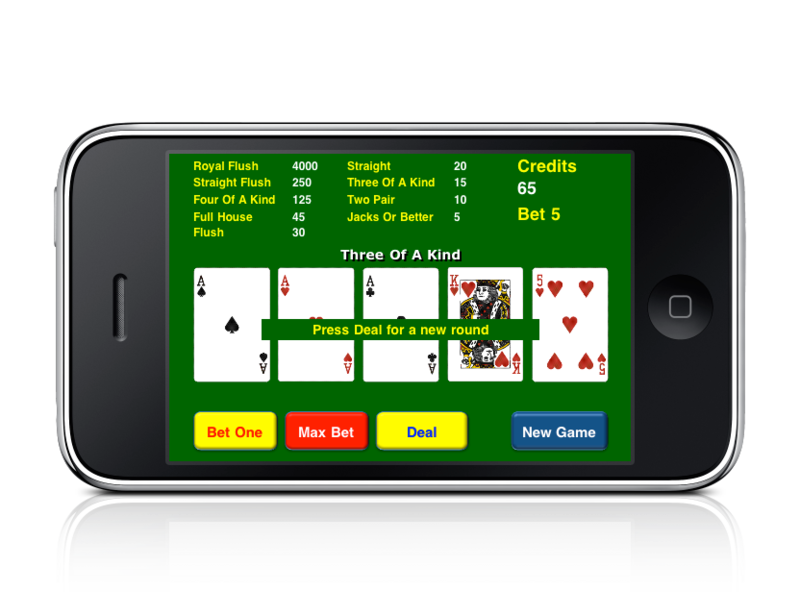 If the score in your current hand is higher than Pair (Jacks or Better) you will have the opportunity to double your score with Double or Nothing. In this mode, you can try to predict if the card, which follows the card on the screen, is Lower or Higher by choosing the appropriate buttons. Each turn “costs” a number of points, depending on the current bet you have selected. The minimum score from the table is Pair (Jacks or Better). Therefore, if you get a Jacks or Better, no points are added to your total score and no points are taken. If you don’t get anything, you actually lose points! This is how handheld and Vegas video poker games work. When you are dealt replacement cards for your discards, your new hand is evaluated. Based on what kind of hand you’re holding, you’ll receive a certain number of points from the score table. If you exit from the application in the middle of your hand or game (for instance, you have pressed Home button or received a call) the application will save the current position and continue from the exact same point where you stopped playing in your previous session. Ace can count as either low or high. See “Royal Flush” scoring, below. The same order applies to Double or Nothing, except that Ace is always the highest ranked card (i.e. there is no low Ace). * Royal Flush – From 250 to 4000 points. A straight flush, with the Ace high. In other words, a Ten, Jack, Queen, King and Ace, all of the same suit. * Straight Flush – From 50 to 250 points. Five cards in denomination sequence and are the same suit. For example: Five, Six, Seven, Eight, Nine. * Full House – From 9 to 45 points. A three of a kind and a pair at the same time. * Flush – From 6 to 30 points. All cards in your hand are the same suit but not in denomination sequence. * Straight – From 4 to 20 points. Five cards in denomination sequence and different suits. For example: Three of Clubs, Four of Spades, Five of Clubs, Six of Diamonds, and Seven of Hearts. * Three of a Kind – From 3 to 15 points. Three cards of the same value. * Two Pair – From 2 to 10 points. Two pairs of cards. In other words, two cards in your hand are the same value, and two other cards in your hand are also the same value. * Jacks or Better (Pair) – From 1 to 5 points. Two cards in your hand are the same value. In this version, they must be Jacks or better!